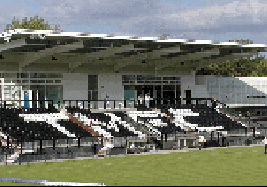 Tooting & Mitcham United FC (TMUFC) occupied a dilapidated ground at Sandy Lane in Tooting which is in a residential area. Cranbrone Developments approached TMUFC with a proposal to build them a new stadium on a disused training pitch previously used by Chelsea & Crystal Palace at Bishopsford Road in return for their existing site that they wished to construct residential properties on. This was a very attractive proposal to the football club but although they knew their basic requirements, they had no expertise on the technical requirements of a football stadium. William Martin was employed to advise on the content of the contractors proposals and monitor the project on site. A review was undertaken of the proposal including establishing if it was in accordance with the Ryman League Rules Green Guide and other such legislation. William Martin undertook liaison with the local authority as well as making the Safety Certificate application. Extensive negotiations were undertaken with the developer subsequent to this review and amendments made to the proposals. The final proposal comprised a 3,000 person capacity stadium (600 seating and 2,400 standing) together with other facilities including an artificial training pitch, practice pitch and 10,000 sqft of lettable space. William Martin ensured this lettable space was suitably flexible to be utilised for a variety of uses and provide TMUFC with a supplemental income. Regular monitoring of the works on site was undertaken as well as assistance at completion in snagging and obtaining the Safety Certificate allowing TMUFC to play their opening game against Chelsea.